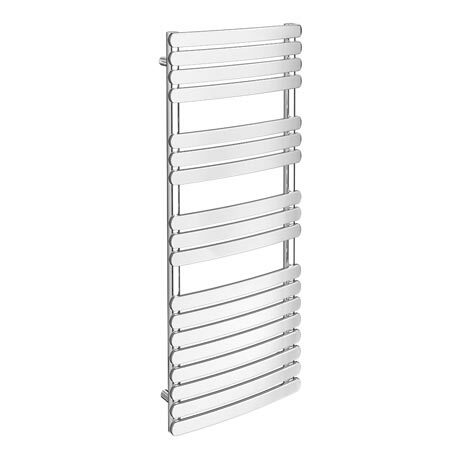 The 1200mm high Murano heated towel rail is an excellent addition to our designer ladder towel rail range, features a classic timeless design. Manufactured from durable steel with a quality polished mirror chrome finish, this stylish curved profile towel rail provides superb heat output which will gently warm towels and your bathroom or cloakroom. Supplied complete with fixing kit, including plugs and vents. Good quality, well built, looks designer! We hunted for a curved radiator originally but wanted a bit more designer looking but not the designer price! Liked the heat output on this one as well as many that look fancy don't have a good heat output especially when you buy in chrome finish. Really lovey chrome finish, nice good solid quality feel as well. Easy to install as well. You also get good space behind the rails to put big fluffy towels on. Really pleased with this brand/purchase.